Oh. My. Gosh. These are amazing! That is what my daughter said when she tested the last batch of sourdough cinnamon rolls. And I must say, I have to agree with her. I told you that I had a little more tweaking to do on the recipe before I shared. The tweaking has come to an end, and I am pleased to share the “fixed” recipe with you. It actually doesn’t bear a whole lot of resemblance to the one I started with, but that’s ok. Drum roll please! I now give you the recipe for OMG Sourdough Cinnamon Rolls. Heat milk and butter just until butter is melted. Sprinkle yeast over milk mixture and stir to dissolve. Put flour, sugar, salt, and potato flakes in large mixing bowl and stir to mix. Add starter, eggs, and milk mixture and mix until combined. Dough should be fairly stiff. If too dry add milk 1 Tbsp at a time; if too wet, add flour 1 Tbsp at a time. Turn dough onto a lightly floured surface. Knead for 5 to 8 minutes without adding too much extra flour. Dough should be slightly sticky. Form dough into a ball and wrap with plastic wrap. Let rest for 10 to 15 minutes. While the dough is resting, butter 2 9 x 13 baking pans, and prepare filling. In small mixing bowl melt butter. Add sugar, brown sugar, and cinnamon. Mix well. I have found that when you mix it into a paste like this, it stays put better when you are rolling the dough up. After dough has rested, cut into 2 equal pieces. Roll out 1/2 the dough on a lightly floured surface into a 15 x 24 ish rectangle. Spread with half of the filling mixture, making sure to spread to the edges on the shorter sides and one of the long edges. That is so the end pieces have plenty of filling in them. 🙂 Roll up the dough starting on the long side that has the filling all the way to the edge. Cut into 12 equal pieces and place in the buttered pan. Flatten slightly. Rolls should not be touching. Cover with plastic wrap. Do the same with the second piece of dough. Let the rolls rise for 45 minutes to an hour, or until doubled. When the rolls have doubled in size, bake in a 350 degree oven for 30 to 35 minutes, or until they are golden brown. Brush the rolls with melted butter. This keeps the rolls from getting hard. Place pans on cooling rack and let cool slightly before spreading with icing. While rolls are cooling, prepare icing. Soften cream cheese in the microwave. (You can skip that step if you happen to remember to take the cream cheese out of the fridge early enough so that it is soft enough to work with). With a whisk, stir until smooth. Add milk, vanilla, and salt and mix well. Add powdered sugar and whisk until smooth. Spread icing over the cooled rolls. If the rolls are too hot, the icing will just melt and run off. Sprinkle with cinnamon. This recipe makes 2 dozen rolls that are light and fluffy, with just the right amount of cinnamon filling yummyness and icing that is not too sweet. You can even make the rolls ahead and refrigerate overnight before baking if you want to. Just let them come to room temperature and make sure they have doubled in size before putting them in the oven. These are really easy to make and I have the feeling that I will be making them often. Enjoy! After a week or so of amazing mid-70’s springish weather, yesterday was cold and thunderstormy and today we’ve had snow flurries. You can’t get bored with the weather in Oklahoma! So, I thought today would be a good day to perfect my sourdough cinnamon rolls. Especially since tomorrow is going to be almost 80 and I won’t want to be in the kitchen then! And I kinda promised some to a friend for Saturday morning. So today’s the day. I found a wonderful recipe for bread machine cinnamon rolls and then adapted it to use my sourdough starter and to make by hand. Since I don’t have a bread machine. I probably wouldn’t use one even if I did. It’s not that I’m a bread machine snob or anything. Really. It’s that bread making is kinda therapeutic for me. Some days I just need to knead. Well, I was going to post this yesterday. Oops! But, since I didn’t, I’ll just update you on the cinnamon rolls. They turned out pretty good. Not, Oh my gosh those are amazing, but pretty good. My friend seemed pretty happy about homemade cinnamon rolls that she didn’t have to make. I’ll tweek it a little more this week and see what happens. If they turn out better than pretty good I’ll share the recipe with you. I thought today I would share one of my favorite sourdough recipes with you. Now, I know what you’re thinking. You’re thinking that you don’t want sour waffles, and I can’t say that I blame you. I don’t want sour waffles, either. The great thing about this recipe is that you get all the benefits of the sourdough, without it being sour. No, really. I promise. They are really good. And if you do happen to want sour-y waffles and even more of the benefits of the fermenting process, you can mix the batter up the night before (or in the morning if you’re having waffles for supper, which we do sometimes) and let it sit on the cabinet. Or, you can just mix it up and use it right away. Which is the way I make them. Both directions are included. Remember, when you are using a sourdough starter, you may have to adjust the milk or flour in a recipe depending on how liquidy your starter is. Put flour, brown sugar, salt, and baking soda in large bowl. Mix briefly. Add sourdough starter, eggs, milk and melted butter. Mix thoroughly. Adjust batter thickness by adding either milk or flour. OR for a tangy waffle, mix all ingredients except eggs and baking soda in a large bowl. Adjust batter thickness by adding milk or flour. Cover and let sit for 8-14 hours or overnight. Add eggs and baking soda and mix thoroughly. Preheat your waffle iron for 10-15 minutes. 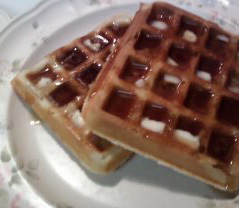 Pour 1/2 to 3/4 cups of batter on the hot waffle iron and close the lid. Let cook for 3-5 minutes until golden brown and crisp. Serve with butter and your favorite syrup or fruit. Enjoy!